Ouch! That smarts! Treat your minor cuts, scrapes and scratches with the incredible healing power of a designer bandage from Accoutrements. And if a fancy bandage isn’t enough to dry up your tears, how about a FREE TOY! Each comes in a 3-3/4" (9.5 cm) tall metal pocket tin and contains a small plastic trinket to help make even the ouchiest owies feel all better in no time. 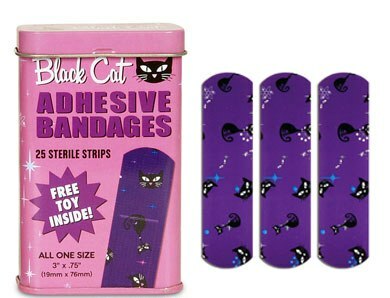 These Black Cat Bandages measure 3" x 3/4" (7.6 cm x 1.9 cm) and come twenty-five per tin. These bandages are now extremely rare as they were discontinued by the manufacturer and are hard to find.